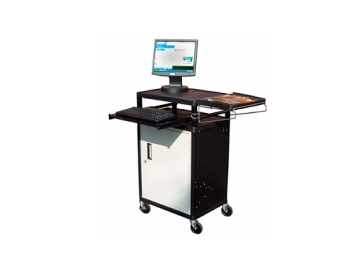 Presentation Cart with locking Cabinet. 3-outlet Surge Suppressing Electric Assembly Mounts Inside Cabinet. Unit Size: 36 1/4"(W)w/ side shelf. (24" without). x18"(D)x41"(H). LT34PC 36 1/4" (w/side shelf)24" w/out	 18"	 41"	 4"	 72 lbs.